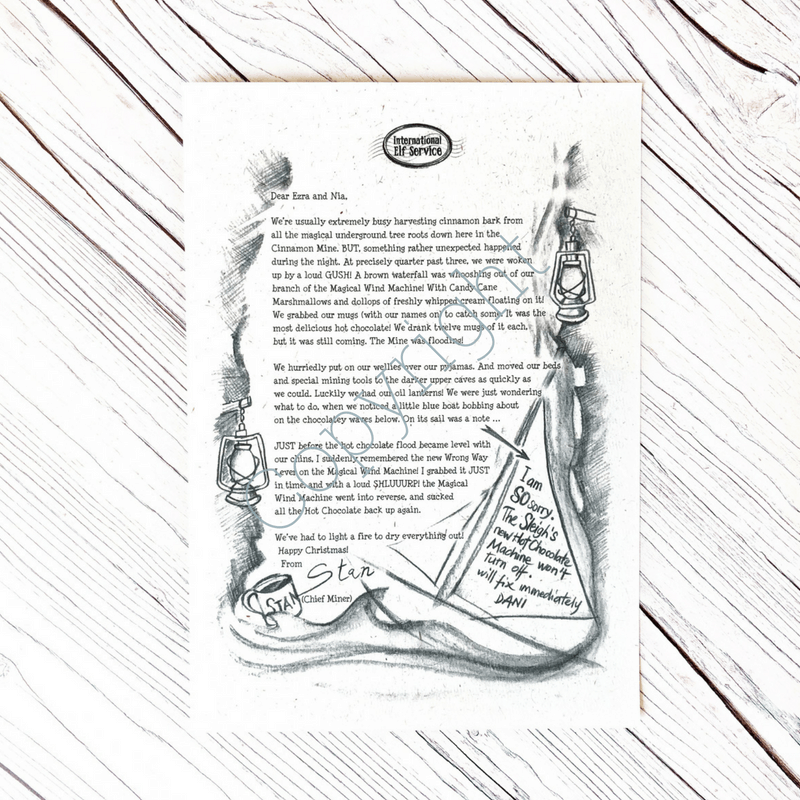 Exquisitely handcrafted and personalised letters, full of newsy snapshots from the North Pole … for a huge dollop of Christmas Magic! 100% Recycled Paper. The Elves borrow Father Christmas’ computer to write letters full of secrets and snippets from the North Pole, to all the children in your family. You secretly deliver a new letter on their behalf, on the lead up to Christmas. Pop one by their toothbrush, in their shoes, on the door mat, or in their school bags … ! 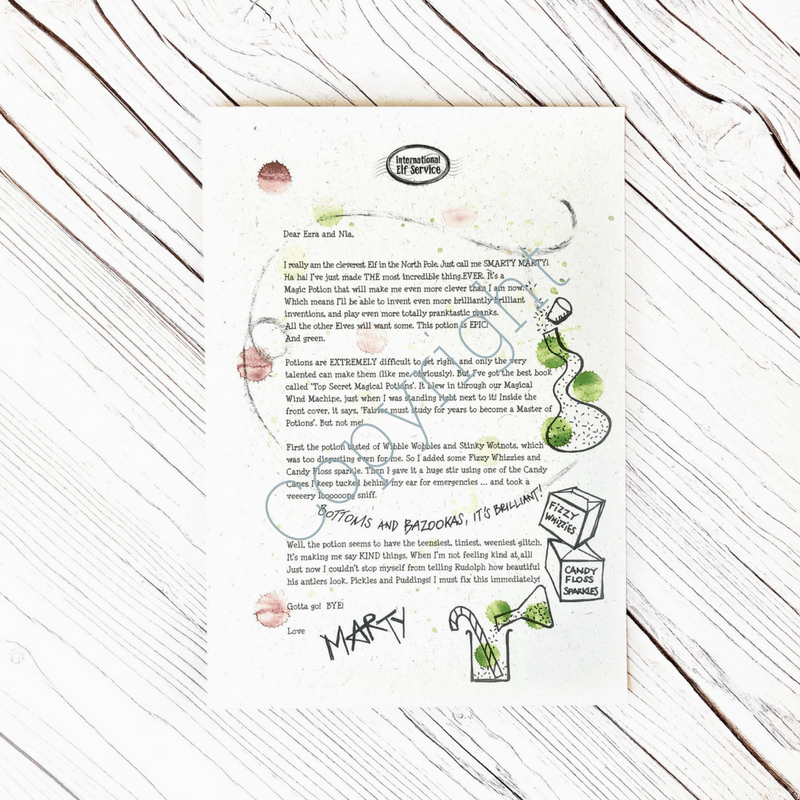 7 letters, each by a different elf, addressed to your children, and illustrated in their individual styles, complete with splodges and smudges. 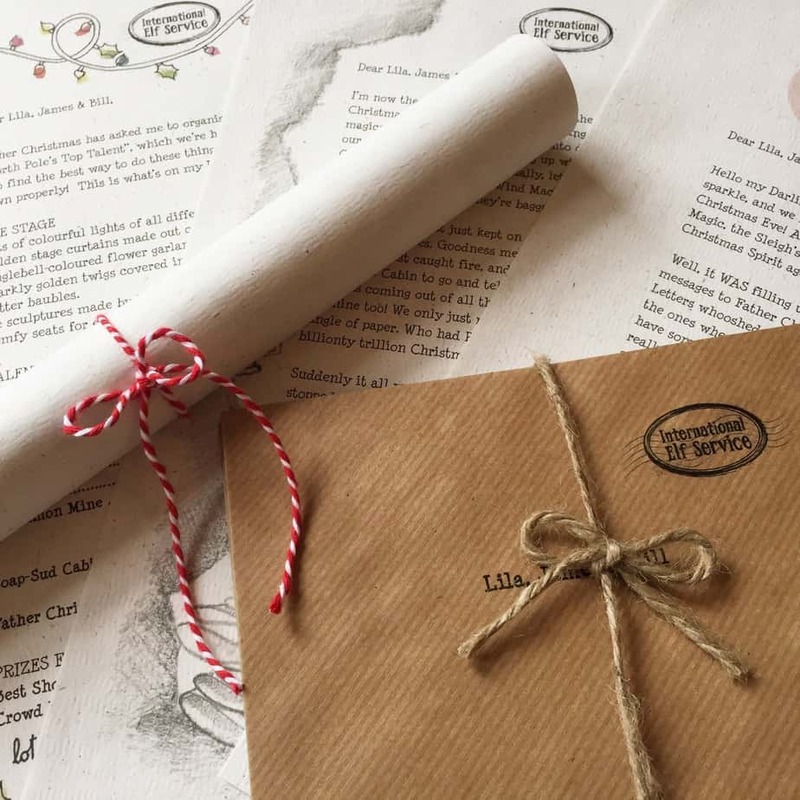 8 lengths of North Pole Candy Cane Twine to tie each letter into a scroll, OR 8 personalised envelopes purchased as an extra. … loves pranks, inventions, experiments and sweets, and is always up to something. And this year’s no exception! He’ll do anything to avoid hard work. Or any work. The question is … has his new Magic Potion turned out as he’d hoped? He didn’t like how it tasted first of all, so he added a couple of things to sweeten it up. But … was this a big mistake? And will his new Automatic Dressing Machine ever work properly?? …being the most organised Elf, has started one of her infamous “Important Lists”. The Elves have been invited to a Disco Sleepover in the new Magical Ice tree on Christmas Eve! Among the prizes Lily has planned, are Magic Sprinkles (that change your hair colour as many times as you like, for one week), and a voucher to miss ONE weekly bath. Lily thinks Marty’s highly unlikely to win the “Best Behaviour After Festive Midnight Feast” prize! … his list of things to sort out, seems to be growing! The big Clock in the Elves’ Workshop that usually sings “We Wish You A Merry Christmas” to whoever arrives at the door, has been playing ‘There’s A Worm At the Bottom Of My Garden” instead. Which is totally UN-Christmassy and not at all welcoming! But his most urgent job is to mend the Jingle Bells on The Sleigh. They’re all battered and bent, and sound terrible! He’s also adding a few exciting ‘extras’ to The Sleigh this year … including an Ejector Catapult! … the Chief Miner in the Cinnamon Mine, (and is particularly good at drawing). They were all woken up at precisely quarter past three in the middle of the night, by a loud GUSH. The Mine was flooding with Hot Chocolate! Despite drinking twelve mugfuls each, the Cinnamon Mine continued to flood! Will they manage to get out in time? … and the other Elves in Pine Needle Lodge, are working with a rather exciting selection of 40 different fabrics for Father Christmas’ special Christmas Eve Safety Underwear. They’re planning some very excellent safety features to cover all eventualities! The underwear controls will be linked up to Lyra’s new Computerised Route Planning System, to ensure the right feature is activated at the right time! Fabulous! The kids love getting the letters and it will hopefully prolong the magic of Christmas in our house for at least a few more years. 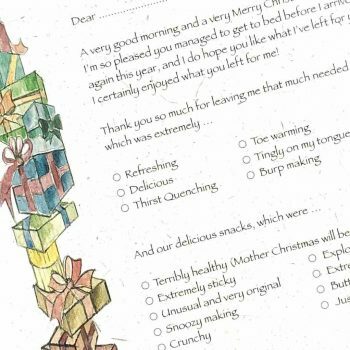 These are so lovely, I bought them for my 7 year old granddaughter, she already has an elf, but getting all these letters from other elves is making it so much more magical. She cannot wait to show me them when I see her. My grandchildren loved these letters and it added such a sense of anticipation in the run up to Christmas. This is our second year of Elfies letters, such a great item to keep December mornings fun my son absolutely loves to see what all the Elves have been up to. Can’t wait to see what happens next year!! Received the mini letters last week. My children are 7.5 and 9 and they love these letters. They are well written and beautifully illustrated. They certainly add an extra bit of magic to our Christmas! These are a great way to enhance the magic of Christmas and it’s unique too. My daughter is 9 and enjoys finding the letters. We went to Lapland when she was 5 and use the map to talk about the memories we made there. 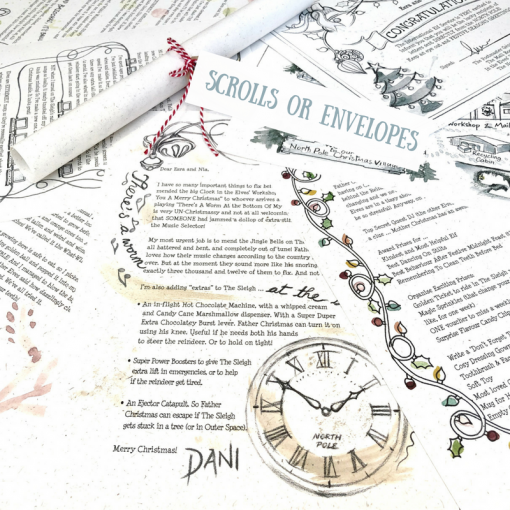 Love the recycled paper and the elves’ sketches and splodges! They look totally authentic. I have read that the letters are different each year too. Well done International Elf Service! These are amazing! My 8 year old is so excited to receive he next one! I’ve just ordered the Father Christmas letter for Christmas Day to finish it off,can’t wait! Magical! Thank you. I have these letters to help my little boy, who has autism, to gauge the time in the lead up to Christmas, and keep interest going, my daughter loved them too and even showed her class! Highly recommend these….amazing! These are amazing – fantastic quality and so worthwhile. 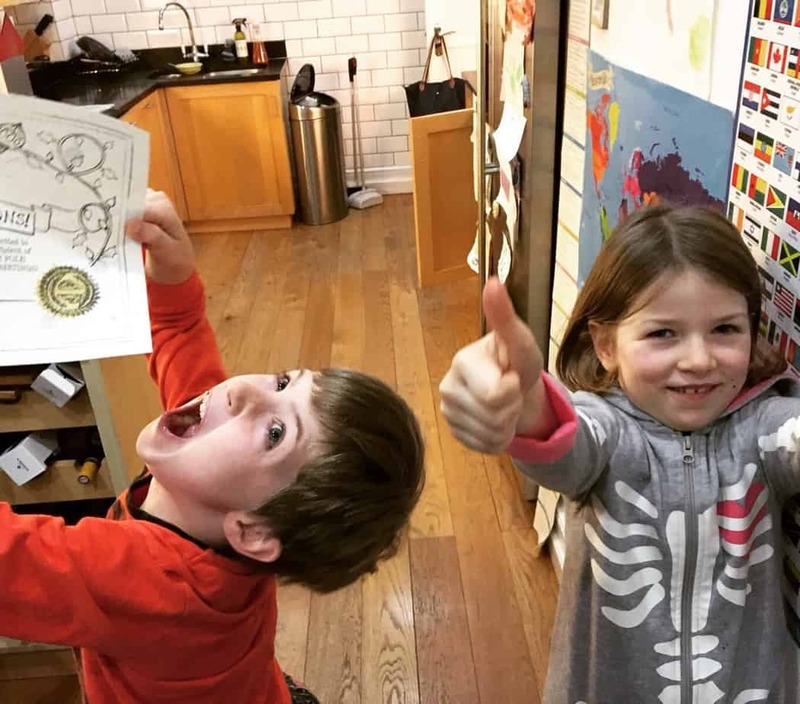 Totally recommend – my 7 year old loves them. 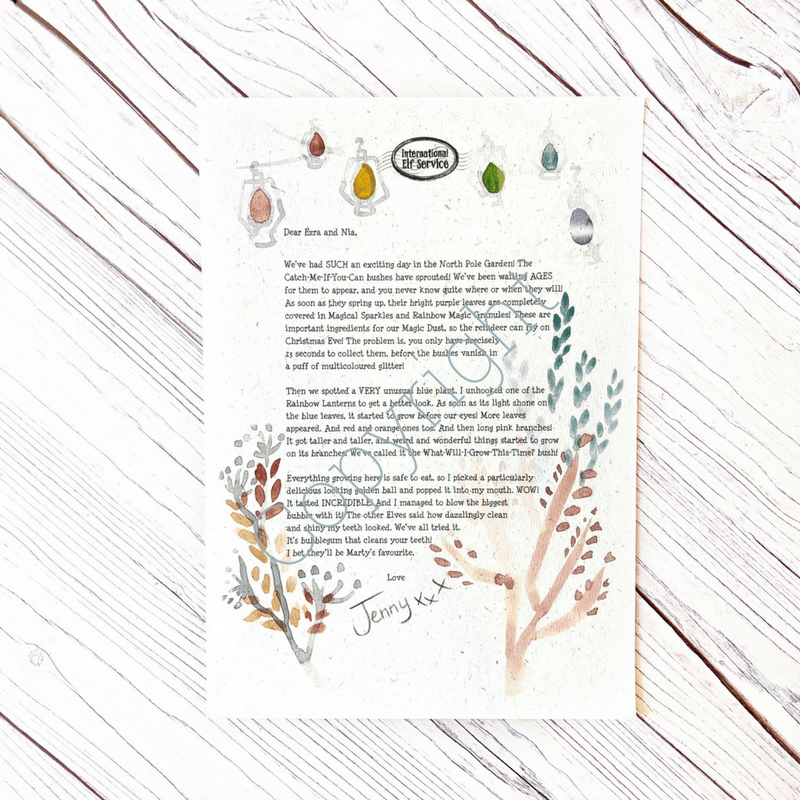 These letters are so beautifully presented and I can’t wait for my grandchildren to find them. I only bought the mini bundle this year as they are very young but will definitely be buying them in the years to come. Magical thank you . 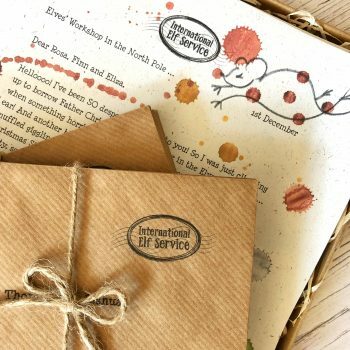 I stumbled upon the Facebook page and got excited to see such a unique Christmas addition to tie in with our elf staying, I purchased the activity letter set for my little one, the letters are beautiful she’s really going to enjoy receiving these and doing the activities. I’m looking forward to December and getting started. Roll on when she’s a bit older for the letter a day bundle- they look amazing too! Would really recommend to friends and family. I purchased the mini North Pole Christmas letters and they’re really sweet. The quality is very good and the content is lovely. My grandchildren will be very excited to receive them. These letters are beautifully written , lovely quality and I can’t wait to see my boys faces when they open them. They are definately going to sprinkle an extra bit of magic im this Christmas. The letters are amazing! Can’t wait for my kids to read them them! I’ll be delivering via our elf door! Beautiful and magical for all ages! Really lovely pack of letters – I can’t wait to see my little girls faces when they open them throughout December! Beautiful letters , can’t wait to see 4 smiley faces ! Absolutely delighted with mini Christmas letters for 2 sets of grandchildren. Ive enjoyed reading them as well. Absolutely lovely! My Grandson is going to love them. Will really add to building the excitement and magic of Christmas. Quick and efficient ordering and delivery. Thank you so much! Cannot wait for my daughter to start finding these, they look amazing & great attention to detail. Love these letters they are good quality and are well worth the money. My granddaughters face was a picture she was so proud that she had received them. I have also had birthday letters they are just as good. The kids loved them. We still have last year’s letters rolled up for safekeeping. 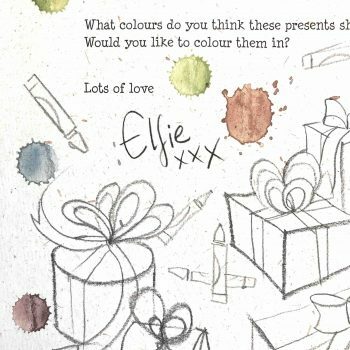 A last minute decision December 2015, my daughter absolutely loved Elfie’s and the others letters she would read them as much as she could, I cannot wait to see her face this year absolutely amazing thank you for extra Christmas Magic.